This head really doesn't NEED to be replaced. It still sounds as good as new, and hasn't broken. 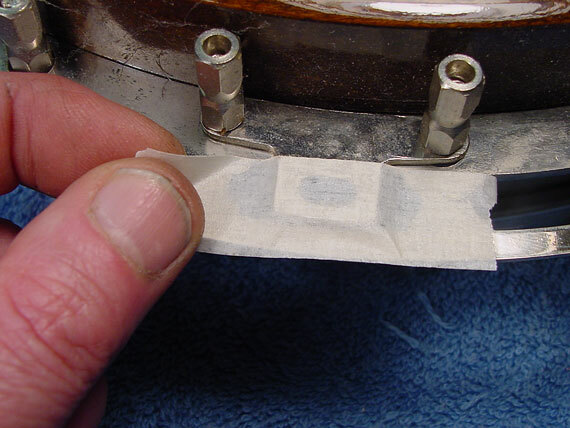 But, it is pretty worn and ugly, so I'm going to replace it with a new plastic head. 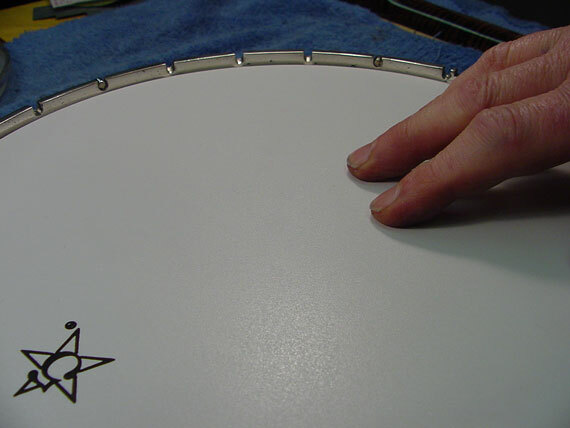 Don't forget to read a bit about banjo head varieties. 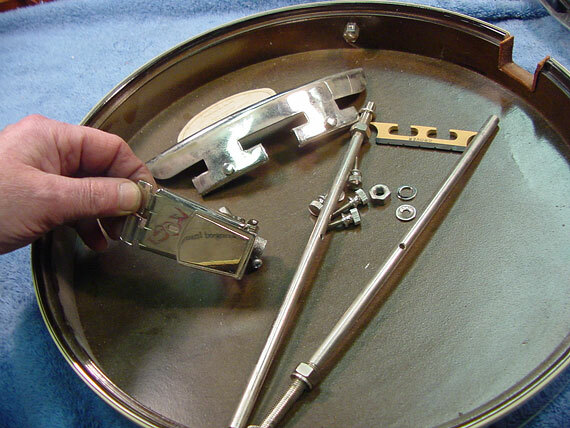 After I take off the resonator, I notice some little resonator mounting plates that will fall off as I remove the hooks and nuts. To avoid losing track of these plates and to make it easier to put them back, I hold them in place with bits of masking tape. I could use a felt tip pen to mark the location of the armrest, and other hardware, or I could simply take a few notes as I go along. 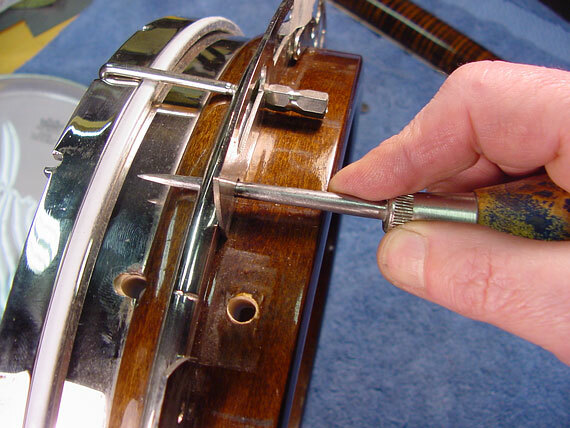 It's a good idea to remove the neck when replacing the head, but it's not always absolutely necessary. 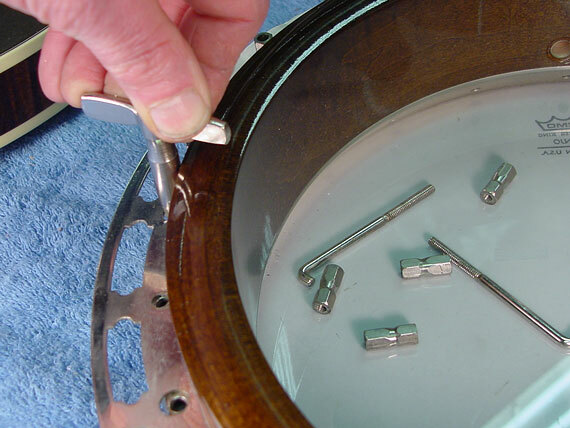 I like to check and adjust the coordinating rods when I replace heads, so I'll take all the hardware off and remove the neck. 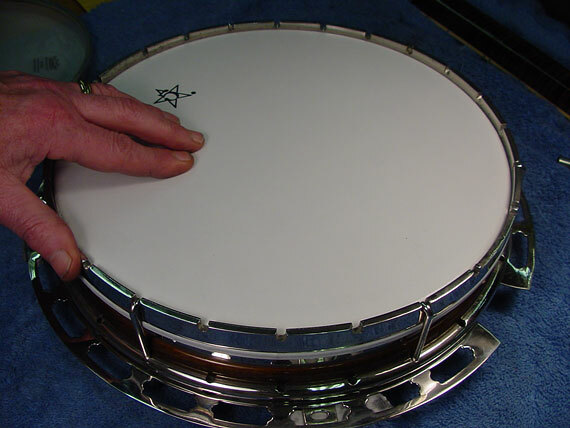 The resonator makes a handy bowl for storing all the neck mounting hardware, resonator screws, bridge, armrest and tailpiece. As I take off all the hooks and nuts, I simply toss them into the head. 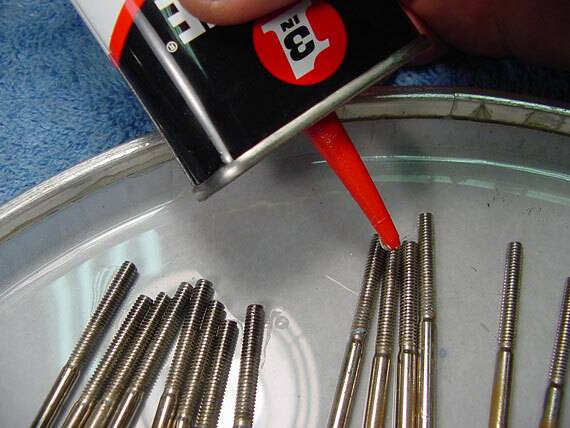 I coat the threads of all the hooks with oil to make it easier to judge the tension as I reinstall the head. The old head is a great place for this operation because it's a leak proof disposable working tray. 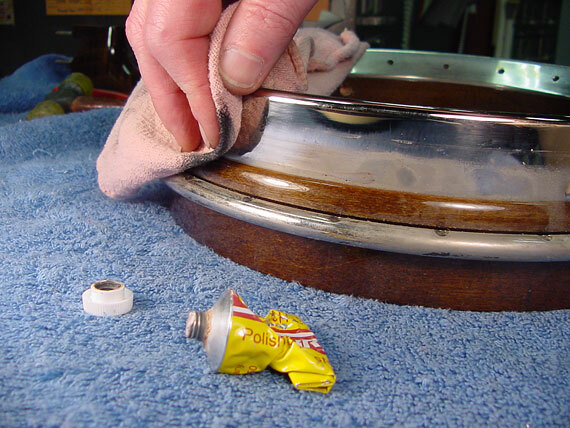 While all the parts are off, I take the opportunity to clean and polish the metal parts. My favorite polish is Simichrome, available from bicycle and auto parts shops. Installing the new head is really quite simple. I put the head on with six of the tension hooks spaced equally around the rim. 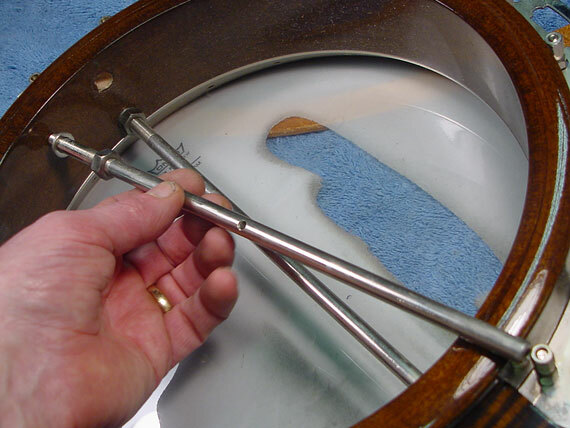 As I assemble the parts, I'm careful to make sure the head and tension hoop are level with the tonering. I check to see that an equal amount of the tension hoop sticks up around the perimeter. Occasionally, a tap with my plastic hammer helps seat the hooks in the tension hoop notches. Then I tighten the head up, using just the six hooks. I like to bring the head up to firm tension with just six hooks to make it easy to keep things level. 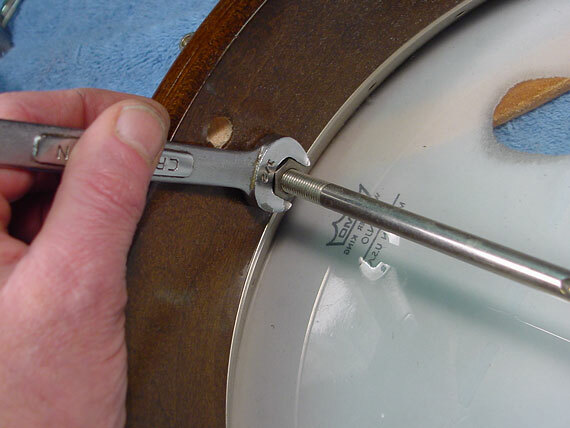 Then, I go around the rim, adding in all the remaining hooks and nuts. When I encounter a misalignment of holes, a tweak with my awl helps straighten out the parts. 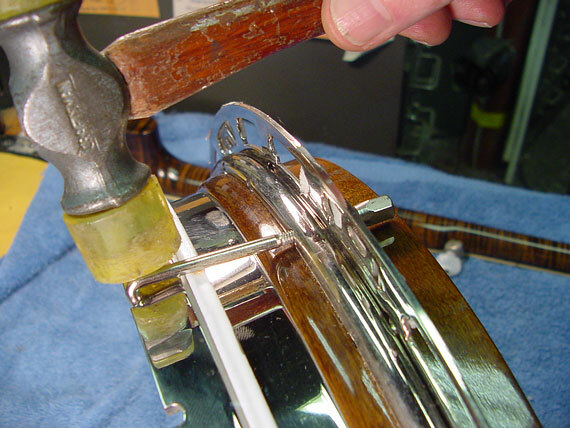 The last step is to tighten all the hooks, taking a fraction of a turn at a time, raising the head to full tension. How tight is right? Well, it's a matter of taste - the tighter the head the brighter the tone, but the less bass response. Some players prefer the head to be as tight as possible without breaking. They determine that tension by experimentation. 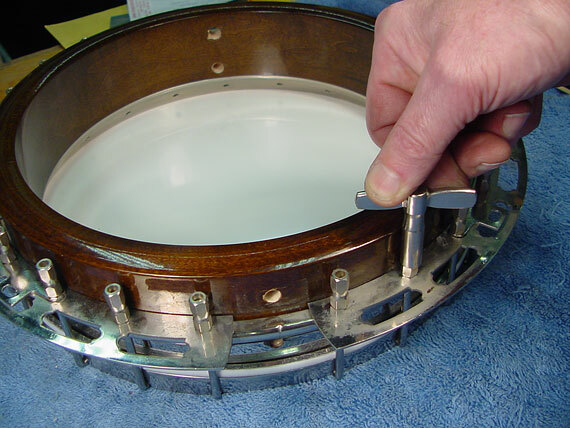 . .
From here, it's a matter of reassembling the neck and resonator to the shell, and setting up the action. I'll remind you to take a look at the coordinating rod article for more on that subject.